Vanee Corned Beef Hash is a breakfast classic made from lightly seasoned ground corned beef and fresh diced potatoes. Perfect grilled up as patties, or on the side of any breakfast item you can think of. 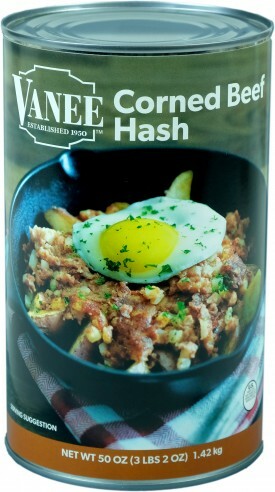 Vanee Corned Beef Hash has corned beef as its first ingredient, is consistent from batch to batch, has better flavor, texture and fries up better than the national brands, and is shelf stable for easy storage. Each 50 oz. can has 6 single cup servings, for a total of 36 servings per case. Open both ends of the can, leaving the loose ends in place, press on one end and force the hash from the can. Slice into 12 patties of 4 ounces each. Grill at 350°F until patties are browned evenly on both sides.